Short post because there isn’t much to say about this generic Strat copy. This is just a generic project guitar. I picked it up cheap because it was broken. The bridge was screwed up, the pickguard was broke and the electronics were shot. I don’t even remember if it had any pickups. It’s what I think is a Fernandez Strat copy. Somebody sanded off most of the logo. Only the F remains. 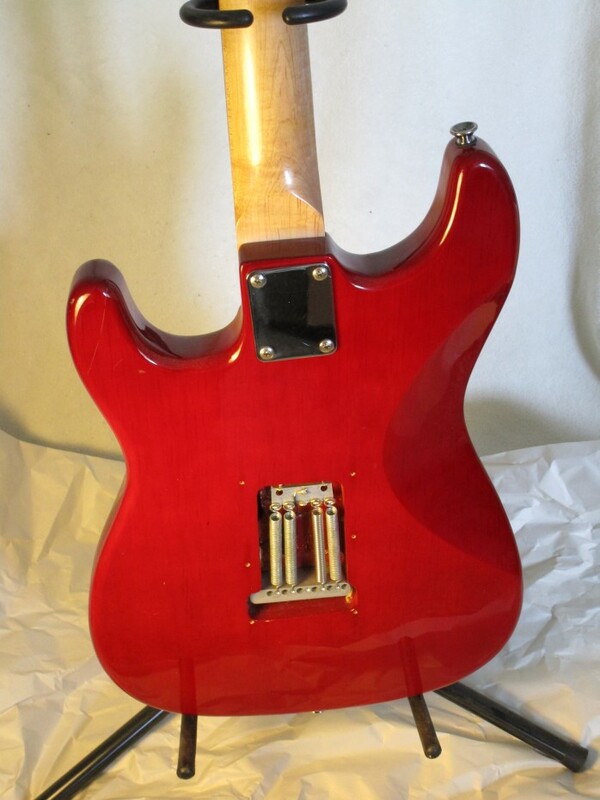 But it has the F and the headstock shape LOOKS like a Fernandez, so that’s what I’m gonna call it. I put on a loaded pickguard from somewhere. Well, I know where. I’m just getting sick of saying “Guitar Fetish” over and over. I bought it from… Bob Fetish. It works. Nothing to complain about, but nothing inspirational either. Sounds like any decent budget priced guitar. Utterly lacking in character. 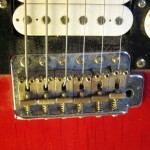 This is a Fender Mexican bridge off a busted Squier Jag-Master. 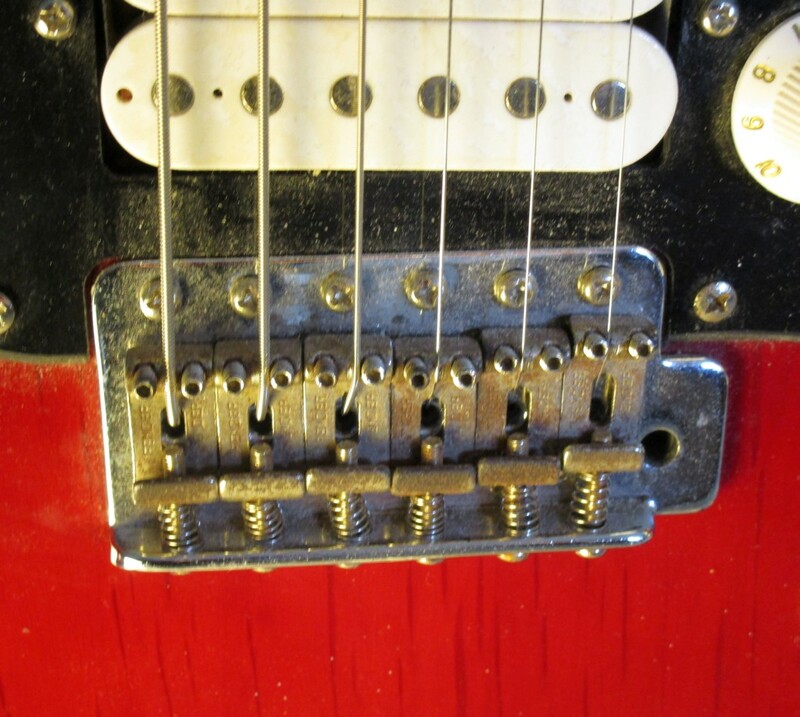 The advantage of smashing a guitar out of frustration – free parts! 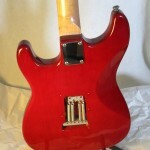 You can also see the grain of the wood peeking through the transparent red finish if you embiggen. A picture of the back side! I don’t like how this guitar plays. It’s set up well and all, but the fretboard is too flat. 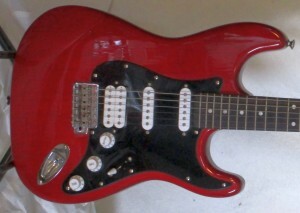 It has a bevy of usable sounds, like a decent quality budget Strat copy. OK if you wanna play covers. – Rhythm Playabiliy: 6/10 Flat fretboard! – Lead Playability: 8/10 Flat fretboard! Uninspiring. On my short list for resale. Posted in Japanese. Tagged fernandez, strat copy.